Since the dawn of thought, the ladder has been a symbol of progress, of ascent, of reaching upward, in many mysteries, faiths and religions. 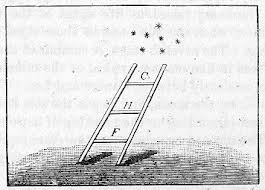 Sometimes the ladder becomes steps, sometimes a stairway, sometimes a succession of gates or, more modernly, of degrees; but the idea of ascent from darkness to light, from ignorance to knowledge and from materially to spiritually is the same whatever the form of the symbol. In the Persian Mysteries of Mithras, the candidate ascended a ladder of seven rounds, and also passed through seven caverns, symbolized by seven metals, and by the sun, moon and five planets. The early religion of Brahma had also a seven-stepped ladder. In the Scandinavian Mysteries, the initiate climbed a tree; the Cabalists made progress upward by ten steps. In the Scottish Rite, the initiate encounters the Ladder of Kadosh, also of seven steps, and most of the early tracing boards of the Craft Degrees show a ladder of seven rounds, representing the four cardinal and three theological virtues. Even in the Mystical Court, there are seven treaders to climb. The ladder rests on the Holy Bible as you start your climb. The theological ladder is not very old but the idea of seven steps, emphasizing the theological virtues by denominating them “principal rounds. The similarity of Jacob’s Ladder of seven steps to the Winding Stairs, with three, five and seven steps has caused many to believe each but a different form of the same symbol. 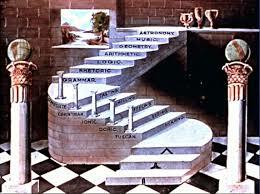 The theological Ladder symbolized progress, just as does the Winding Stair. Three steps or seven, a symbol similar to the Winding Stairs or different in meaning and implications, the theological virtues are intimately interwoven in the Mystical Court system. Our many rituals alter the phraseology here and there, but the sense is the same and the concepts identical. The whole concept of civilization rests upon that form of faith covered in the first definition. Without faith in promises, credit and the written word society as we know it could not exist. Nor could The Mystical Court have been born, much less lived through many years without secular, as distinguished from religious, faith; faith in the integrity of those who declared that The Mystical Court had value to give to those who sought; faith in its genuineness and reality; faith in its principles and practices. Yet our ritual declares that the third, not the first, round of the ladder is “the greatest of these” because “faith may be lost in sight.” Faith is not needed where evidence is presented, and in the far day when the human soul may see for itself the truths we now except without demonstrations, faith may disappear without any consciousness of loss. But on earth faith in the divine revelation is of the utmost importance to all, especially from the Mystical standpoint. No atheist can be made a Mystical member. Any man who misstates his belief in Deity in order to become a member of The Mystical Court will have a very unhappy experience in taking the degrees. “Hope spring eternal in the human breast; Many never are, but always to be, blest,” blending a cynicism with the truth. “Confiding, though confounded; hope coming on, Untaught by trial, unconvinced by proof, And ever looking for the never seen.” And yet, vital though hope is to man, to Mystical members, and thrice vital to faith. our ritual says that charity is greater than either faith or hope. To those whom charity means only handing a quarter to a beggar, paying a subscription to the community chest, or sending old clothes to the Salvation Army, the declaration that charity is greater than faith or hope is difficult to accept. Only when the word “charity” is read to mean “love,” as many scholars say it should be translated in Paul’s magnificent passage in Corinthians, does our ritual become logically intelligible? Charity of alms can hardly “extend through the boundless realms of eternity.” To give money to the poor is a beautiful act, but hardly as important, either to the giver or the recipient, as faith or hope. But to give love, unstinted, without hope of our faith in reward – that, indeed, may well extend to the very foot of the Great White Throne. It is of such charity that Mystical member’s faith is made. He is, indeed, taught the beauty of giving that which is material; the Rite of Destitution shows forth the tender lesson in the first degree; Mystical Homes, Schools, Foundation, Orphanages and Hospitals are the living exponents of the charity which means to give from aplenty to those who have but a paucity. The first of the principal tenets of our profession and the third round of Jacob’s Ladder are really one; brotherly love is “the greatest of these” and only when a Mystical member takes to his heart the reading of charity to be more than alms, does he see the glory of that moral structure the door to which The Mystical Court so gently, but so widely, opens. Posted on December 9, 2018 December 9, 2018 by HH Sir Godfrey Gregg D.DivPosted in Mystical Court, WRITINGSTagged Mystical Court, St. Vincent.